I’ve been on the sick, lame, dazed, and confused list. Allergies are my nemesis. I keep saying I’m going to rent an ice cave to live in during spring and fall allergy season. Geeze! Knowing my luck I’d probably find something to be allergic to there. As if I wasn’t having enough fun with allergies I jacked my back and knee up royally. Poor me. LOL! Looking forward to getting into the swing of blogging again. I’m going to continue with my lighthouse blogs. Lighthouses in this country have amazing history. 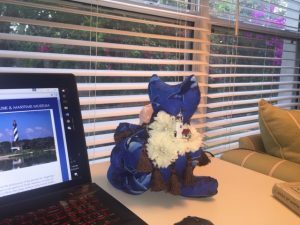 I want to share the photo of Blue Kitty, the Lighthouse Cat a friend and fellow lighthouse-ophile, Christine, sent me. I finally have pics to post of a kitty next to my computer. Look carefully and you can see the lighthouse pin Kitty is wearing. Before I get started on new Lighthouse posts I’d like to tell you about the United States Lighthouse Society. It’s a nonprofit historical and educational organization dedicated to saving and sharing the maritime legacy of American lighthouses. It also supports lighthouse preservation throughout the country. You can register online to become a member. Go to here to find out more. 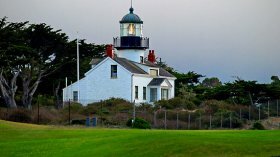 The Point Pinos light is situated on the Monterey Peninsula and is the oldest operating lighthouse on the West Coast. The Socialite Keeper is quite the story. There is also a lighthouse passport program. 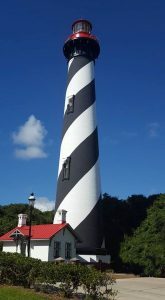 If you like to visit lighthouses this program provides enthusiasts the opportunity to help preserve lighthouses as well as a wonderful way to keep a pictorial history of their visits. Donations made by passport holders generate thousands of dollars for lighthouse restoration and preservation. 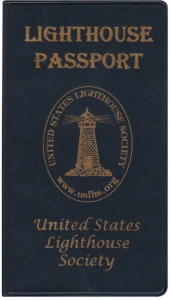 Next time you visit a lighthouse ask about joining the passport club. Some lights have guest lodging in centuries old light keeper’s homes. Quite a few come complete with a ghost or two. Do you have a favorite lighthouse? Of course, mine is the St. Augustine Florida lighthouse. I grew up two blocks from the black and white 165 foot tower. Right before my allergy/knee debacle I was preparing to join a group that climbed the lighthouse steps, that’s 219 steps, every day for exercise. Now, I’m not saying I was planning on climbing all 219 every day. I had sort of decided to drop the 200 and do 19 steps a couple of days a week. That sounded like a plan to me. But it seems my body wasn’t pleased with that and fixed it so I couldn’t do it. Still doing PT for the knee, but climbing to the top of that tower is on my bucket list.